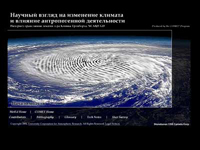 This is the Russian translation of "The Science of Global Climate Change and Human Influences" a Webcast by Dr. Kevin Trenberth of NCAR’s Climate and Global Dynamics division. The presentation includes evidence that the atmosphere is changing, discussions on global energy flows and human factors contributing to change, and concludes with predictions for the future. Why quiz is't in english?